Spacious updated townhome style condominium conveniently located in Sun Creek adjacent to Hiwan. Boasts a newer kitchen with a handcrafted concrete counter top and back splash set atop white raised paneled cabinetry. Shiny black appliance finished with satin silver handles complete the kitchen. New hardwood floors cascade from the kitchen to the vaulted great room with fireplace, to the hall and down the stairs. Carpeting was just laid in the dining room and master bedroom. Many of the interior walls have been freshly painted providing a clean look. There are two additional bedrooms in the garden level with a family room, wood stove and access to the two car garage. 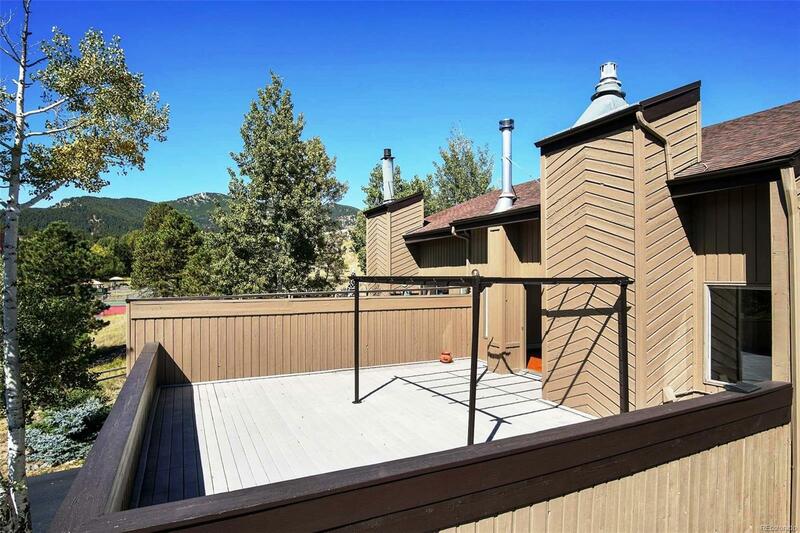 Enjoy the outdoors on the two decks; a sun drenched front deck with views of Bergen Peak and a private deck with a fenced yard in the rear of the home. An affordable price for North Evergreen.